I looked out of the kitchen window last week and spied this little fellow. He is made out of leftover hand spun. 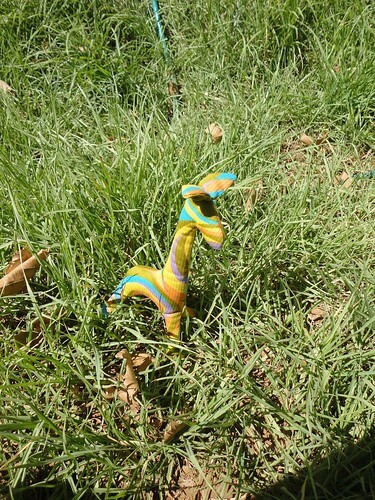 Further investigation of the yard revealed this little family hiding in the grass. I needle felted the eyes and beaks, that’s a lot of fun (I can see great possibilities). 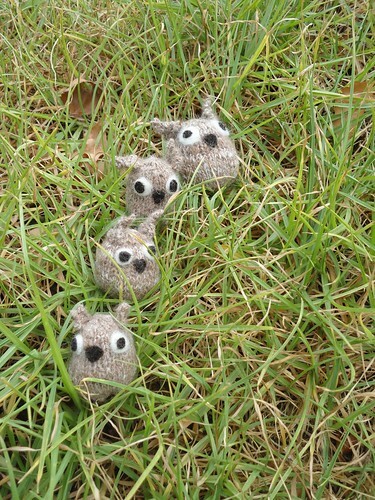 The owls are handspun alpaca and merino. 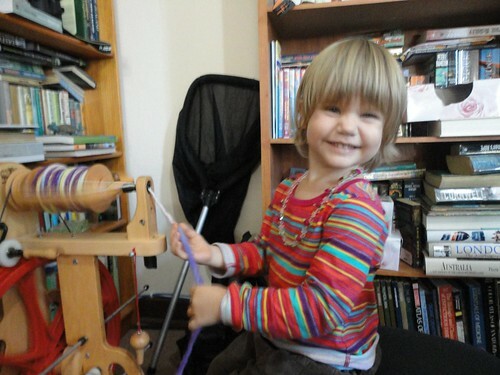 She’s a bit short still, so I sit on the floor next to her and give the treadles an occasional push, and she’s not drafting at all, just letting the fibre wind onto the bobbin with some twist added, but she is getting the hand motions needed and is having fun. Apparently I am to knit this into a hat for her when it is finished. I have also been spinning. 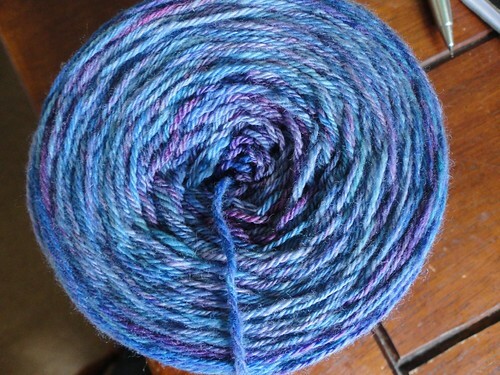 The yarn cake is superfine merino – three ply (navajo-plied) and the skein of yarn is tussah silk. 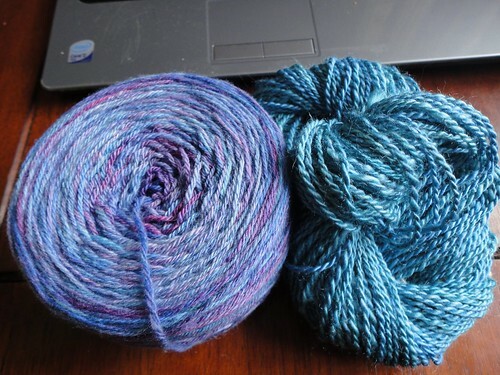 This was my January fibre club selection. This is really soft and lovely. When we first moved to South Africa we lived in a gated community and our next-door neighbours were a very lovely couple. One day P visited while I had a quilt in progress spread out on the floor. A few days later she turned up with a garbage bag full of scraps from her father’s store. Given that her children were older than I am this is real vintage fabric. I made this little guy a while ago out of some of that fabric and realised recently that he’d never been shown on the blog. Gorgeous Girl is quite taken with him. When I was pregnant with Gorgeous Girl I bought some yarn off e-bay. When I received it I realised that it was much bulkier than I like to knit with and the colour runs were very, very short. It sat in the stash until I found a pattern that I thought would work. 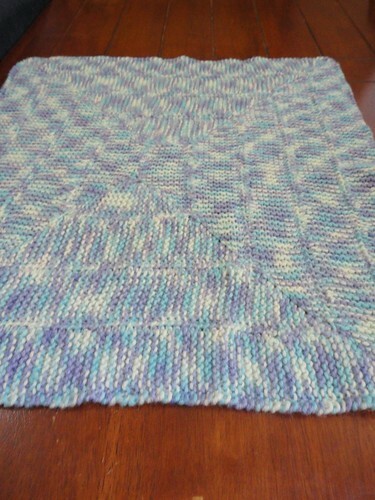 This is Ten-stitch Blanket. 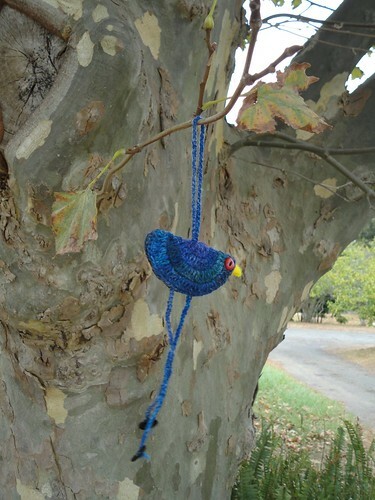 I really enjoyed knitting this and will probably do it again in a finer yarn. 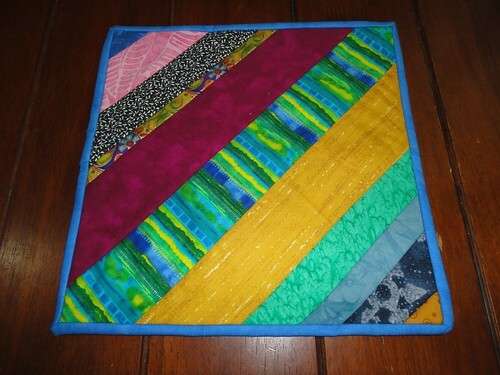 This quilting block didn’t measure up to go with the others (there were some issues with a gaping seam and too much batting showing through on one back corner), but I didn’t want to waste the fabric, so I did a bit of top stitching and added an extra wide (at the back ) binding and now I have a mug mat next to my computer. I knitted this hat for Gorgeous Man. 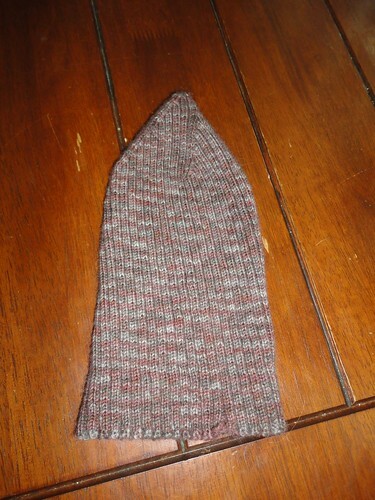 I didn’t decrease as far as the pattern directed, but it still has a little pointy bit when you wear it (reminds me of German World War I helmets) so it will be my ‘wearing inside my impossible to heat house’ winter hat. Here is the current quilt in progress. I picked up the red fabric when Helen took me to her quilt store in Amsterdam last year and the setting fabric is a jelly roll that I picked up when I was home in Australia in 2009. So it’s a real travel momento quilt. 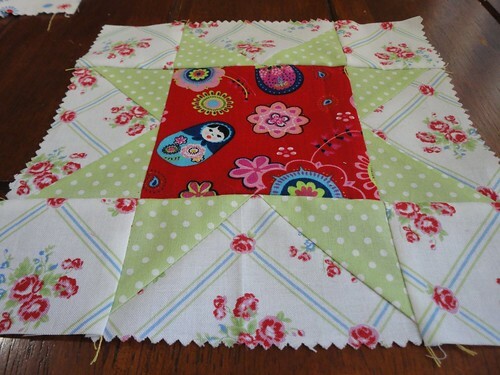 Don’t look too closely at the points… There will be 12 blocks in all and I’m planning on sashing this with white. 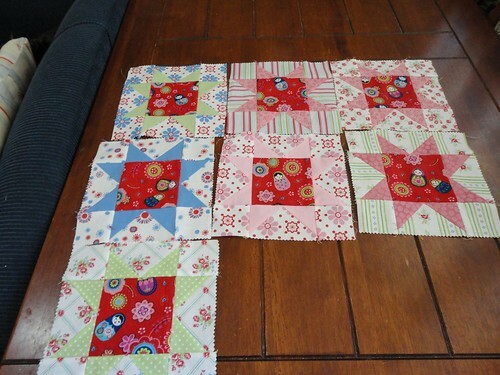 I haven’t decided on pure white sashing (both up and down) or whether I’ll add cornerstones from the red fabric. I’ll have to have a play and see. A friend recently told me that the big fabric store in town had the Very Hungry Caterpillar fabric. So on Sunday Gorgeous Man, Gorgeous Girl and I paid it a visit. They didn’t have very much Very Hungry Caterpillar fabric left (I was lucky to find a panel in the remnants bin) but they did have Brown Bear, Brown Bear what do you see? 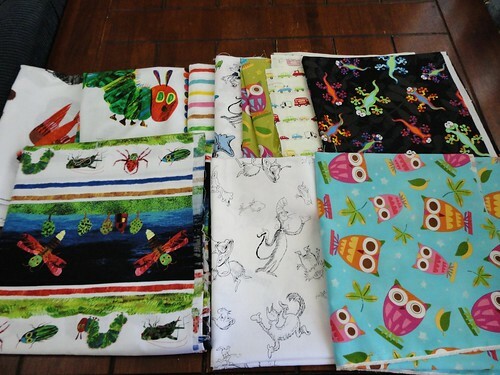 fabric as well as Dr Suess Fabric which is a huge favourite in our house. The black gecko fabric was Gorgeous Man and Gorgeous Girl’s contribution to the purchases. I’ll leave you with some eye candy. 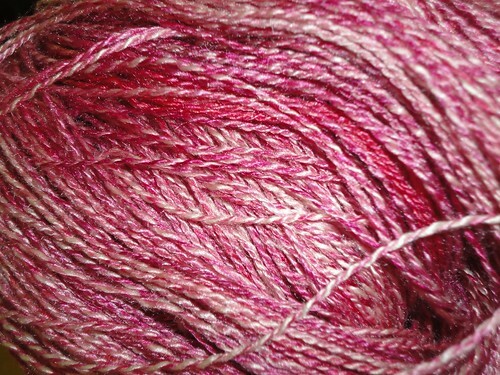 My latest spin – 100% silk.